There is a real sense of the exotic in this image! Stunningly beautiful! That's a wonderful view, Tom. Gorgeous. Beautiful shot for Sky Watch Friday... Hope you are enjoying a great day! Tom: A great colorful florida sunset. This must have been a great start to the day... it is a beautiful view. Oh my! This looks like a painting. It's absolutely gorgeous. I love the welcoming colors at the start of the day. I hear they have the best shelling on Sanibel Island too! Seriously, this is a beautiful sunrise and is so peaceful an calming! Just beautiful!!! Oh the sunsets are wonderful here, I also used to call our home Butterfly island, as the AMAZING butterflies were everywhere 10 years ago before mosquito treatment for tourist began. The sunsets are still amazing. Google "Sanibel Air Traffic" and show some support while these and other fascinating island creatures are still holding out. 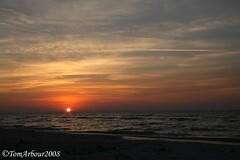 There are some cool local Sanibel photos linked from that page also!